Here is a quick little trick for #TeamBlackBerry! I use my calendar app quite frequently for both work and personal appointments. If I have a meeting with a client, I put it in my calendar and set a 1 hour reminder to allow me time to get there (even if I forget I had an appointment). I also use it for Doctor's appointments, car service appointments etc. Did you know that you can share those appointments? 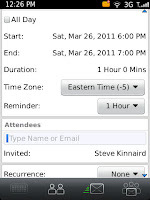 Ever since OS 4.5 you have been able to invite people to a calendar event. This feature is similar to Microsoft Outlook's meeting requests, and all you need is an email address of the person(s) you wish to invite. Open up the calendar app and select create new appointment. 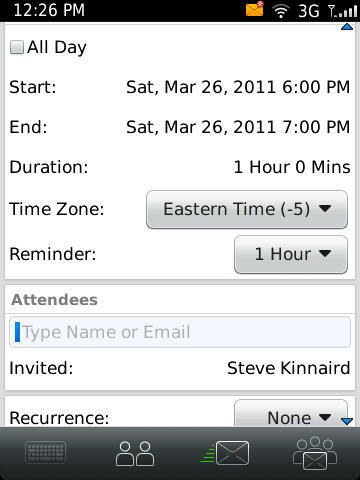 Choose the email address you wish to send the invite from (you have a calendar for each email address you have sent to your BlackBerry). Fill in the Subject, location and time. Set the reminder for your preferred time. 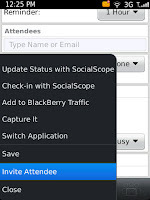 Now click the menu button, and select invite attendee. 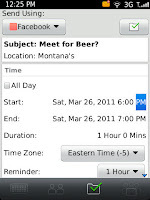 Select the person(s) from you address book that you wish to invite. I always invite my wife to my Doctor's appointments, so she knows when they are :-) You can add more than one person if you like. Once you have finished adding people and you save the event, your BlackBerry will send a request via email to your friends. But wait...it gets better! If your friends have a BlackBerry also, they can actually accept or decline the appointment right from their BlackBerry. If they accept it, it is automatically added to their calendar aswell! If they decline, they can add a reason why and send it back to you. You will be notified if they accept or decline it. 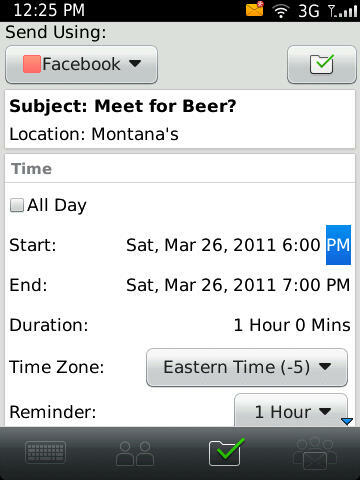 All names you invite will belisted in the calendar event for you. What do you think? Pretty cool stuff? Digging your blog, found it by accident, glad I did. Follow my blog as well www.alienswanted.com and see all the things I have to say. I too love my Blackberry, but am open to seeing what others can build. It will be hard to get me from Blackberry, though. Thanks for the kind words! I appreciate it very much!